ww2dbaseFaye Lazebnik was born into an Orthodox Jewish family in Lenin, Poland (now in Belarus) in 1924. Her brother Moishe ran a photography business and taught her photography. After the German occupation of Poland, her family was deported to the Lenin Ghetto. In Aug 1942, her parents, sisters, and younger brother were rounded up and killed, sharing the fate of about 1,850 other Jews from their ghetto; she was spared because her photography skills were deemed useful to the occupation. 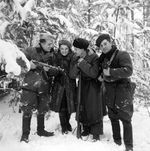 She was tasked with developing photographs for the Germans, including those documenting the massacre of Jews. She secretly produced copies of some of the photograph, and brought them with her when she escaped captivity one month after her family's tragedy. 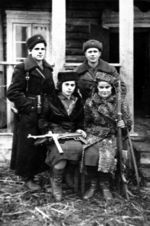 She joined the partisan group Molotava Brigade in late Sep 1942 and would remain with the group until Jul 1944. She was given basic medical instructions and served as a nurse. She also continued to take photographs, especially the Jewish members of the Molotava Brigade. She noted later that "I want people to know that there was resistance. Jews did not go like sheep to the slaughter." In 1945, she discovered that her brother Moishe had also survived the war. After the war, she married former partisan fighter Morris Schulman, taking on his surname. Faye and Morris Schulman lived at the Landsberg Displaced Persons Camp in southern Germany for some years, where they coordinated the smuggling of weapons to Palestine to arm Israeli nationalist fighters. In 1948, they moved to Toronto, Canada; they had originally wanted to move to Palestine/Israel, but decided against it as they were now with a newborn daughter, and thought Canada was a much safer place to raise a child. In 1995, she published her memoir under the title A Partisan's Memoir: Woman of the Holocaust. 28 Nov 1924 Faye Lazebnik was born in Lenin, Poland (now Belarus). 14 Aug 1942 Faye Lazebnik's parents, sisters, and younger brother were rounded up and killed; they shared the fate of about 1,850 other Jews from the Lenin Ghetto in Poland (now Belarus).